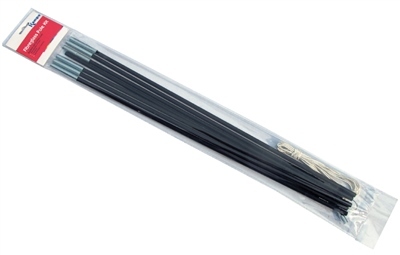 The Kampa Fibreglass Pole Kit Set is universal for most types of dome or tunnel tents. As fibreglass poles for any manufacturer are not covered under a standard warranty, it is essential that spare poles are taken on any camping trip as the great British weather is unpredictable at best! Each kit is make up of 7 - 9 tent poles with ferrules, 2 spigots, 400 cm of elastic shock cord. Please note, do not shorten any section by more than 10cm as this may affect the flexibility. It took a while to figure out how to lay it all out to work for my tent, but in the end it was enough to fix the broken pole assembly and make a spare from the new poles and the old ones that were not broken.